Give a fancy goblet to a poor priest. Go to the Hall of Justice to steal a Large Dwemer Goblet from Berel Sala's office. Get the goblet, which is sitting on the desk in front of Sala's nose. Donate the goblet to Danso Indules, who is outside near the High Fane. For the seventh (and last) quest in this series, Jim asks you to steal a Large Dwemer Goblet from Berel Sala's office in the Hall of Justice, Vivec, Temple Canton. Once you have the goblet, donate it to Danso Indules, who is outside the High Fane. Sala can be found in one of the Justice Offices, and he has the Large Dwemer Goblet on the desk in front of him (rather a challenge). Indules should be found in the tunnel outside in the center of the Temple Canton and once again, give the goblet to her in the name of the Bal Molagmer. Return to Jim for his congratulations. Stealing the goblet is rather simple if you have any form of Telekinesis (i.e. ring, spell, etc). Simply open the door in the corner nearest the goblet, walk down the hall a few steps and turn around. The goblet should be easy pickings. 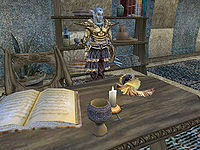 While you're at it, the Indoril Helmet that's lying on the same desk as the goblet is rather nice - it has a good Armor Rating (just don't let the Ordinators catch you wearing Indoril gear) and is worth 3,000 gold if you don't need it yourself. During the Fourth and Fifth Trials of the Main Quest, after you receive a sealed package from Athyn Sarethi during the Redoran Hortator quest, you will not be able to talk to Danso Indules. Finish both Trials and you'll be able to talk to her again. If you are on PC and have one of the expansions, you can bypass the problem with the console command SetJournalIndex B8_MeetVivec 0. There are three more Large Dwemer Goblets in Druscashti, Lower Level. The description of the goblet is misspelled: it is called a "Large Dewmer Goblet". 10 Gentleman Jim Stacey asked me to steal Berel Sala's large Dwemer goblet and donate it to Danso Indules in the name of the Bal Molagmer. Berel Sala is the head of the Ordinators. He and his Dwemer goblet are in the Justice Offices in Vivec. Danso Indules wanders about the city of Vivec healing the sick. I'm likely to find her in the Temple area, near the High Fane. 50 Danso Indules accepted the large Dwemer goblet, but seemed puzzled. 55 Danso Indules accepted the goblet, and seemed appreciative. She has heard stories of the return of the Bal Molagmer. 60 Danso Indules said that he [sic] would not accept anything stolen from Berel Sala. 100 Finishes quest Gentleman Jim Stacey thanked me for stealing Berel Sala's Dwemer goblet and delivering it to Danso Indules.